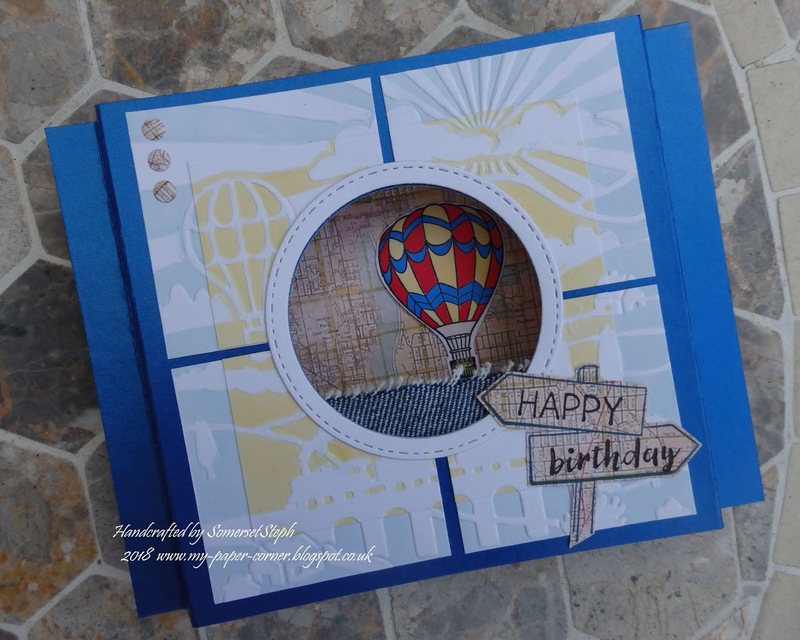 There seems to be lots of different styles of shadow box cards out there but I decided to make this particular design as it seemed easy enough and it folds flat for posting. I had two challenges in mind firstly The Male Room Challenge and then a sketch challenge with friends/members over on the docrafts gallery so I combined them both. The finished card size was 7x5, scored on both short sides at ½" and 1" to achieve the box shape with a circle aperture. The centre panels were embossed with a lovely scenescape, coloured the debossed channels with Tea Green and Buttercup promarkers and cut into squares leaving a small gap to allow the lovely blue base colour to show through. 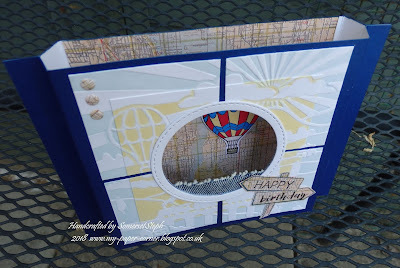 A section of map patterned paper finishes off the inside with a stamped balloon brightly coloured with Poppy, True Blue and Buttercup promarkers. I used the same map paper for the Happy Birthday signpost stamp. As the Male Room Challenge was to include an unexpected item I dug out a piece of denim jeans material to place behind the aperture which has a lovely frayed edge. Great idea to add the frayed jeans it looks like the balloon is flying over the sea. Super idea and love it added texture. 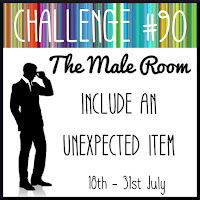 Thank you so much for joining us in our Unexpected Item challenge at The Male Room this week. Looking forward to see you again next challenge. 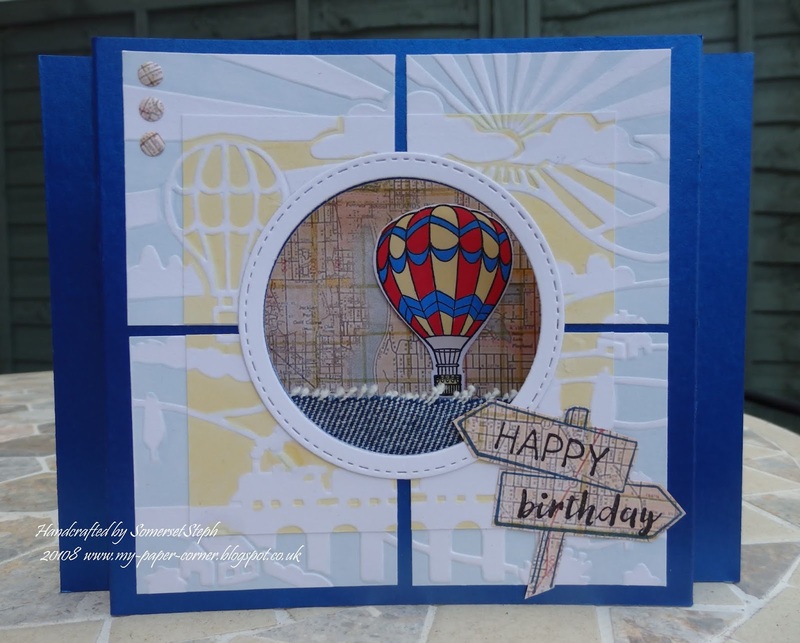 I love the way you've used the frayed denim - it really looks like the balloon is flying over the sea. I love the use of the map paper too! Brilliant work. Thanks so much for playing along with our Unexpected Item challenge at The Male Room. Deborah, DT. Wow! Love your idea to use denim in the card. How creative you are! Thanks for playing along with us at The Male Room for the Unexpected Item challenge. Looking forward to seeing your creative projects again. I do love the use of denim on your lovely card. Great take on our challenge! Thanks so much for playing along at The Male Room Craft Challenge! Good Luck! I stumbled upon a new challenge a few weeks ago that really caught my attention based on using stencils and features a new technique each month CAS Stencil Challenge and ... I also need more practice making clean and simple cards! 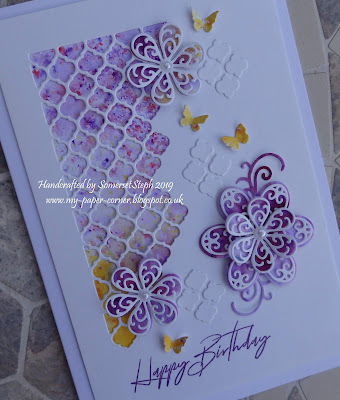 So I planned to try out this month's theme 'Ghosting' which took several attempts to end up with something I was happy to use on a card. My original idea started with a Turn Ahead road sign stencil and a car stamp but it just wasn't working so I 'parked' that idea and went for plan B. Just as well I did as I later spotted in the challenge gallery Robyn's DT card used those very items! Spooky, two crafters with the same idea! I've had this 3D flower box die for quite some time and only assembled it from scrap card just to see how it all went together initially so thought it was about time a finished one went on a card. 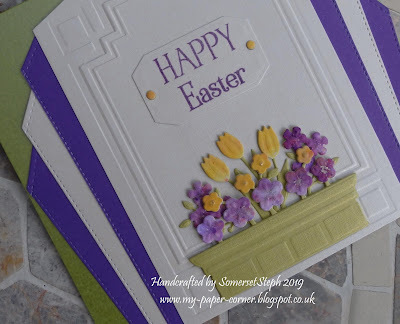 I'm hosting an A-Z colour challenge with friends/members over on docrafts so this is my card using three of the 'H' colours - Highland green, Honey yellow & Honey Flower purple plus a neutral of ivory. The whole flower box die was cut in green & assembled, then the flower heads were cut again from scraps of brusho coloured card in yellow & purple and mounted on top with highlights from a glitter sparkle pen. I haven't truly 3D'd the flower box as it was meant to be as the flower heads are quiet delicate and I didn't want them breaking off in the envelope so they are fixed down! I'm still experimenting with making Brusho backgrounds, this one I'm happy with as it turned out really delicate. I have to learn when to stop spritzing with water and leave the ink to do it's magic! I found the mixed media die locally in The Works and used some of the cut out shapes grouped together in fours to add interest to the adjacent white space. The flowers were created using another purple Brusho scrap underneath the delicate white layer with centre pearls. Added a few yellow butterflies as a finishing touch and a stamped sentiment. Most crafters will know me as SomersetSteph on docrafts where I first uploaded a card to my gallery there in July 2006. 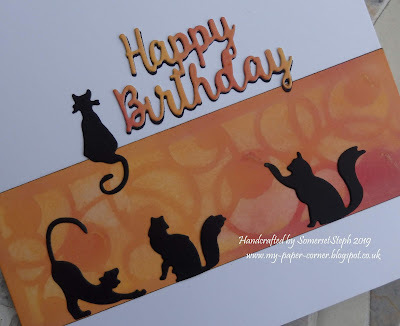 Love stamping & all the different techniques that go with it but I also enjoy Quilling and have been to Calligraphy & Parchment evening classes too. Love taking part in challenges so decided to start a blog in Jan 2018 so I can enter some online ones too.